1. As far as restaurants go, Hell of the North is as good as it gets in Melbourne right now. The bar/bistro in Fitzroy marries heaven and hell with a Euro-bistro grazing menu derived from local produce and fresh ingredients. With choices like reypenaer cheese soufflé, grass fed beef with marrow butter and pulled pork and gruyere doughnuts on the menu, you can’t go far wrong. Hell of the North has a casual, intimate feel that makes you feel at home immediately. 2. Mister Jennings in Richmond knows how to pack a punch in the flavour department. 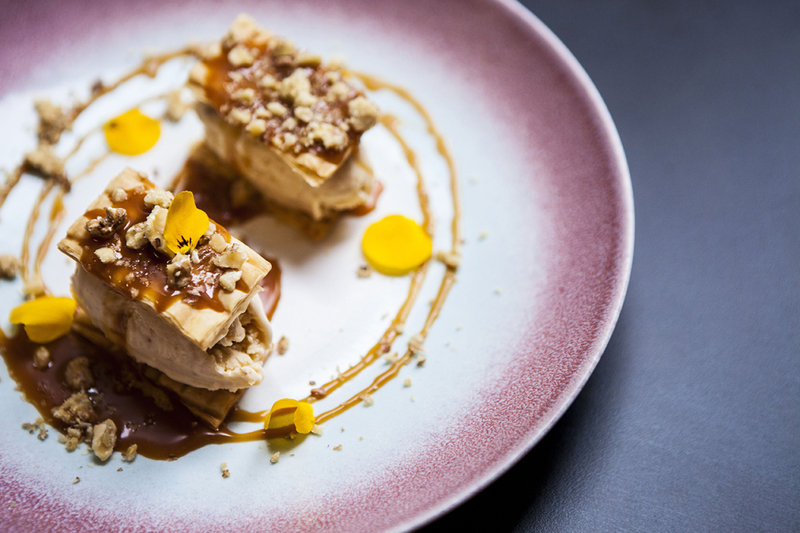 The dishes on the menu, designed by head chef/owner Ryan Flaherty (ex Estelle, Fat Duck and El Bulli) are innovative, creative and always guaranteed keep your tastebuds guessing. Crowd favourites are the blue swimmer crab with gazpacho like salmorejo, kangaroo carpaccio and the classic sirloin steak. A good value five course tasting menu is also available for $80 per person. The wine list is superb, curated by Lincoln Riley (Stokehouse). 3. If you’re not yet familiar with Armenian food, do yourself a favour and book Sezar (pictured) immediately! The cosy restaurant is hidden in one of Melbourne’s tiny laneways, next to the Kodiak Club. The former Canary Club space has been nicely converted with a large bar and kitchen space. The food is hearty and full of wonderful flavours and aromas. Think spinach and feta boreg served with aleppo mayo, pulled lamb neck with tahini and bastourma spiced beef cheek with charred eggplant. Wash it down with the fierce Sezar Express cocktail – a tantalising mix of sloe gin, raspberry puree and fresh lime. 4. Cobb Lane in Yarraville for its delectable cakes and pastries. Matt Forbes is famous in Melbourne for his sweet treats, all freshly baked on the premises. Hailing from the UK, Matt trained under Michelin starred chefs, Raymond Blanc from Le Manoir Aux Quat Saisons and Michel Roux from The Waterside Inn. The front counter is always full of the sweet aroma of freshly baked salted caramel doughnuts, Danishes and cookies. One of my personal favourites is the peanut butter and chocolate chip cookie which strikes a great balance of chocolate and nuts with its crumbly, soft texture. 5. Supernormal on Flinders Lane is an interpretation of renowned chef Andrew McConnell’s favourite Asian eating experiences. From his culinary experience living and working in foodie hot spots Shanghai and Hong Kong, Andrew brings a unique mix of old and new favourites to the innovative menu. We love the prawn and chicken dumplings with chilli and vinegar sauce and the pulled Korean BBQ pork shoulder. The slick canteen style eatery, features an epic zinc-topped bar upstairs and a karaoke bar downstairs to continue the party. 6. Expect the unexpected at Candied Bakery in Spotswood – an Aussie bakery with an American and European twist. The bakery is constantly packed to the rafters with sweet tooths keen to try their extensive range of sugary treats including cookies, thickshakes and jelly doughnuts. Peanut butter fans – don’t miss their peanut butter and jelly cookie, comprised of two thin cookies sandwiched around a filling of jam and cream. 7. The Grand Trailer Park Taverna on Bourke Street is home to some of Melbourne’s best burgers which are a blend of three types of 100% Australian beef, ground fresh daily and cooked medium. If you’re in need of a meat fix, try to wrap your lips around their epic ‘The Chunk – Double Double’ made up of two beef patties, cheese and all the usual trimmings. For a bit of childhood nostalgia, try their Wizz Fizz icecream and one of their spiked milkshakes. It’s a fun spot to hang out with friends amongst the caravans, Winnebagos and picnic tables. You will feel like you’re holidaying in a trailer park in no time. 8. Pope Joan for its epic brunches. The Brunswick East cafe on the quiet end of Nicholson Street is famous for its seasonally driven dishes, made with local produce from its outstanding food producers and farmers. They serve one of the best full English breakfasts in Melbourne, with David’s bacon, apple & cider sausage, scrambled eggs and Joan’s baked beans. Or for lunch you can try the award winning Cuban pulled pork sandwich. 9. If you love ribs and you’re prepared to get your hands dirty in the process, look no further than Ike’s Rack Shack, in The Beaufort’s back room in Carlton. Old man Ike smokes his ribs overnight with a simple salt and pepper rub and a side of kimchi.. The pork rack comes with a bourbon-maple glaze which I am dying to get the recipe for! Hungry carnivores will love the triple back rack stack. Vegans are also catered for with their vegan ribs, served with polenta, quinoa, zucchini, tomato and confit garlic. 10. With a whopping 22 taps on offer, the Great Northern Hotel, in leafy North Carlton, has one of the best craft beer selections in town, making it the perfect destination for the cunning beer connoisseur. Even in the kitchen, beer is a major focus, with their beer battered fish and chips using 2 Brothers’ 2013 award-winning ‘Taxi’ Pilsner. The timber decked beer garden has all the hallmarks of an old-fashioned community pub with its relaxed, laid back vibe and classic pub fare. Have you discovered any foodie finds in your city this week? If so, would love to hear your comments below! Grand Trailer Park Taverna, very much looking forward to another visit there! And thanks for reminding me that I STILL haven’t gotten around to Supernormal! Argh!! SO much food, so little time!